…you may think this is a scene from the plague movie „Contagion“. Actually, it has happened now in Lagos. Nigerian health authorities are racing to stop the spread of the flesh-eating Ebola virus after the man sick with one of the world’s deadliest diseases carried it by plane to Lagos, Africa’s largest city with 21 million people. 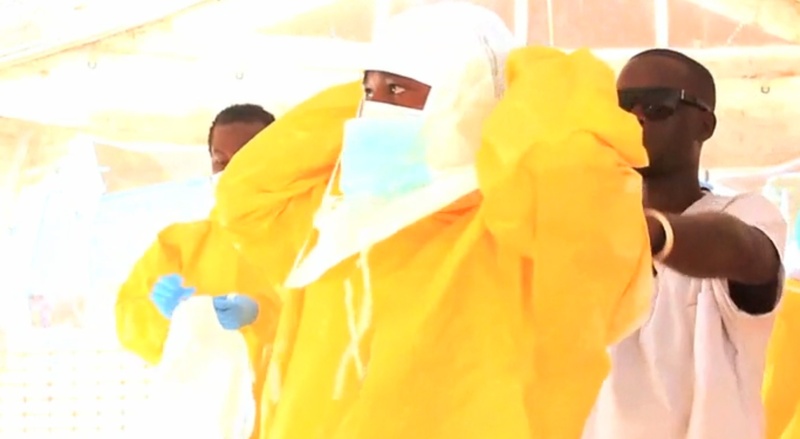 The worst Ebola outbreak ever is paralyzing West Africa. It’s so severe that yesterday, Liberia closed its borders. The World Health Organization says at least 660 people have died in recent months from what has become the deadliest outbreak ever of Ebola. Most of deaths have been in Guinea, where the outbreak is believed to have begun – followed by Sierra Leone and Liberia. Ebola is a form of hemorrhagic fever which is deadly in up to 90 percent of cases. Symptoms include fever and sore throat, which escalates to vomiting, diarrhea, as well as internal and external bleeding. There is no known cure for the highly-contagious disease, although early detection and treatment improves a patient’s chance of survival. VICE News visited Liberia, where many feel the new outbreak began, borne from the bushmeat markets of Lofa. Western scientists feel that the consumption and preparation of meat from monkeys, fruit bats, and other forest animals is behind the transmission of Ebola, and possibly a new supervirus, which if left uncontrolled could kill a third of the world’s population.